Friday we worked the MGAA booth at the Pennsylvania Horse World Expo, and Saturday we returned to take part in the MGAA demo. 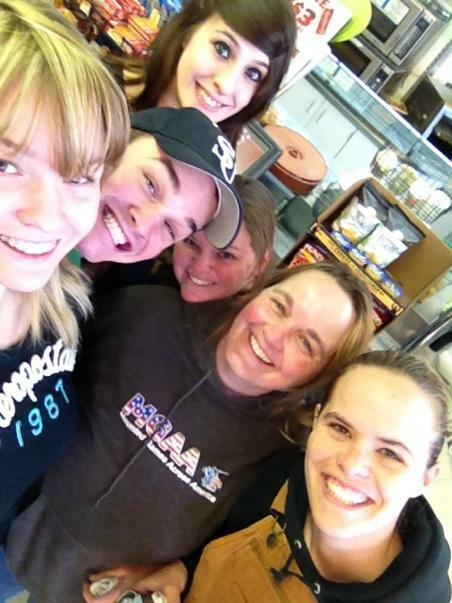 It was slated for 4pm on Saturday in the large arena and we had a full hour. Simon at Kelly's getting dressed to leave. Leading up to the demo day, Simon got to stay at our friend Kelly’s barn for the weekend, where he soaked up her loving hospitality. Simon loves stalls, and would prefer to be stabled part of the time versus a full time pasture pony. So he loved having his very own stall for a few days, although he did follow their pony, Nicky’s example and let himself out Thursday night to frolic around. Kelly bathed, fed and let Simon in and out of his stall for the weekend and he was in pristine order when I arrived to pick him up Saturday morning. I had my wash bucket in hand and found him still squeaky clean. Since I had some time to burn I lunged him for a bit to get out some bucks and then got his wraps on in advance, before loading up and shoving off for PA.
We arrived in a three trailer convoy and managed, after much deliberation, to get parked awkwardly at the end of the lot, but still near the majority of the other MGAA trailers. After parking our group went in to visit the booth, which was hopping with Saturday expo goers, and joined in inviting spectators to come watch our demo and cheer us on. 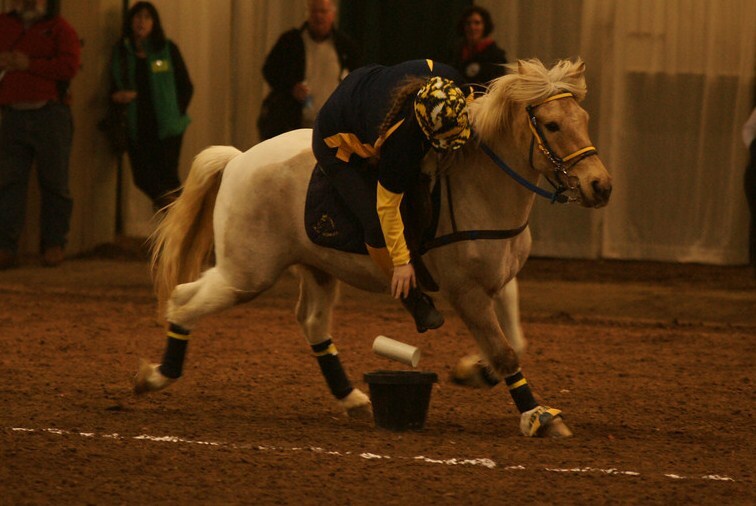 Before long it was time to tack up and get dressed in our navy and yellow gear. Linda, Kim and I combined our team, Old School, with two riders, Nancy and Phyllis, from the pink and black team, Time Flies. Together we were representing the adult, “fossil” division. 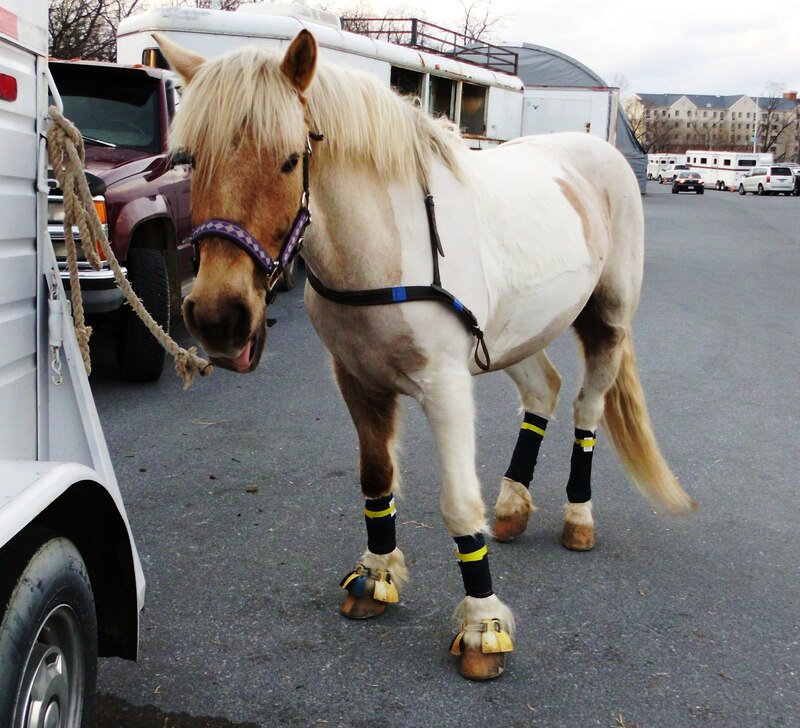 Once tacked up, we spent a bit of time trying to figure out how to get into the venue with our ponies. This was surprisingly difficult as the venue did not have signage or people out to offer direction. We eventially found a people door we were suppose to take our ponies through and then made our way to the holding area. 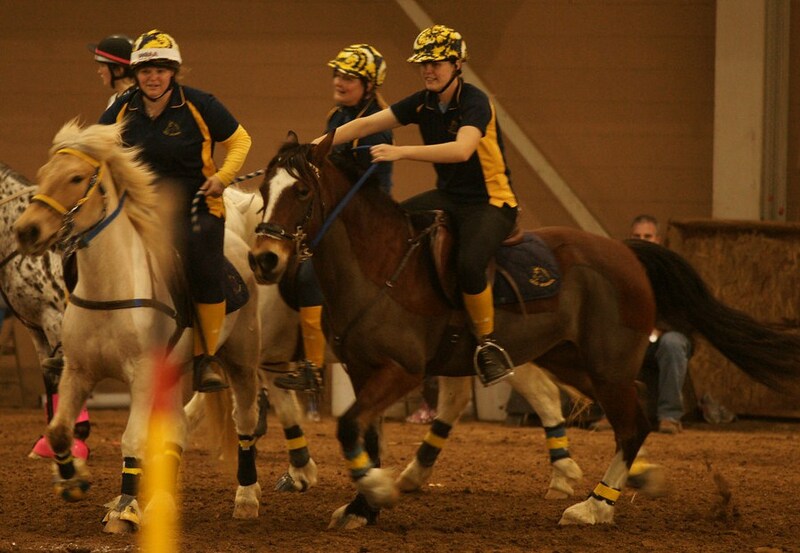 We spent about 40 minutes on deck just outside of the arena as other horses entered and exited for their demo events. Everyone was nervous, ponies included and we were told the house was packing in and there were already 2000-3000 spectators in the arena with more entering. When it was time to go, Linda led the entrance with me and Simon just behind her. 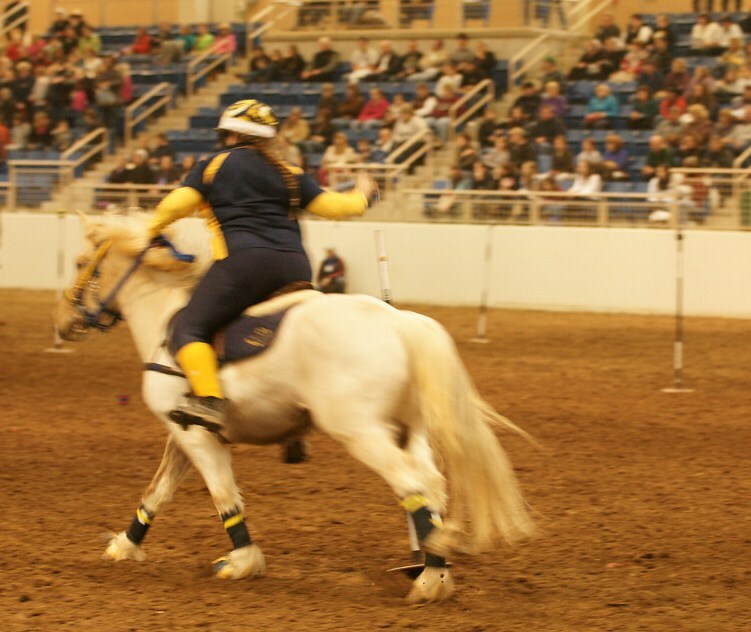 Linda’s pony Blue did not hesitate as we reached the opening to the arena and we pranced into a packed house. The other riders all followed and everyone lapped the arena a few times for warm up as our fantastic ring crew prepared the equipment, and a few short minutes later, we were ready to roll. We started off with speed weavers, which is a pole bending race. Riders cross over the start, or A line, and weave up through a line of 5 poles, turn the end pole and weave back. The incoming rider passes a baton to the outgoing rider who repeats the same pattern, leaving all poles standing. During the set up our announcer encourage the crowd to cheer the riders on and named off the teams describing the difference in age and level of play each team represented. The crowd came through when the team next to us dropped their baton and the arena filled with a united bellow of “OOOOOHHHHHHHH”. The next race was my favorite, Mug shuffle. 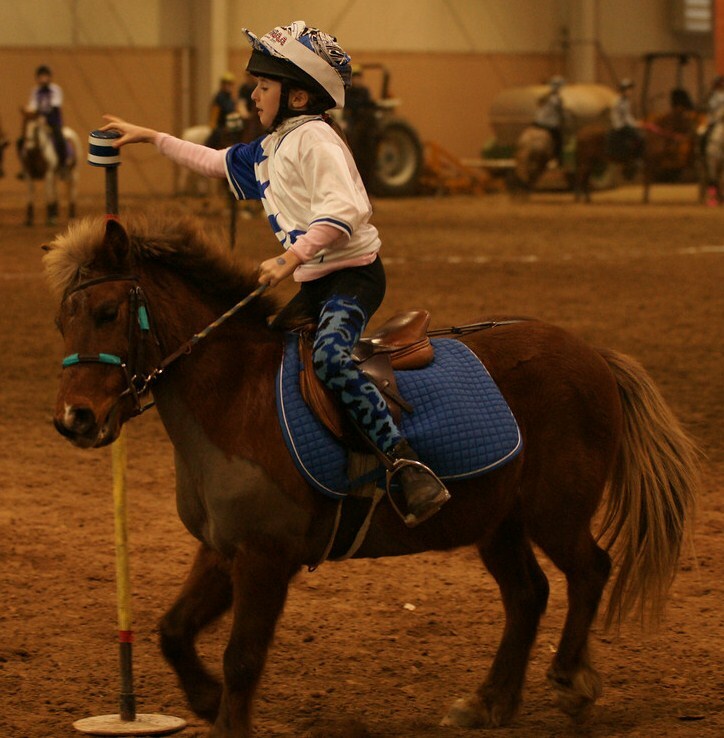 It requires the riders to race along the side of a line of four poles, moving a mug from the top of the first pole to the second pole, and then picking up a second mug on the third pole and moving it to the fourth pole, ending at the opposite side of the arena at the C line. The next rider on each team will repeat the same action, but from the opposite direction, there by returning the mugs to their original poles. 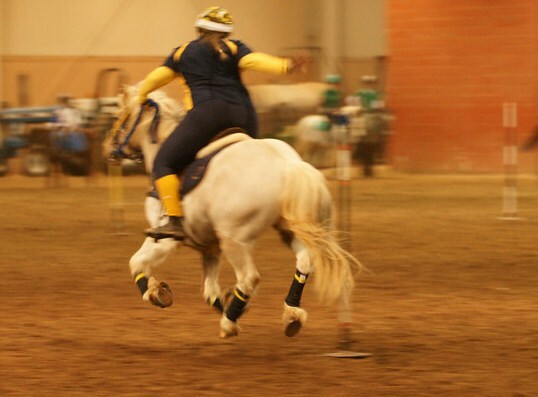 This race is generally run at a full canter or an all out gallop depending on the rider’s skill. 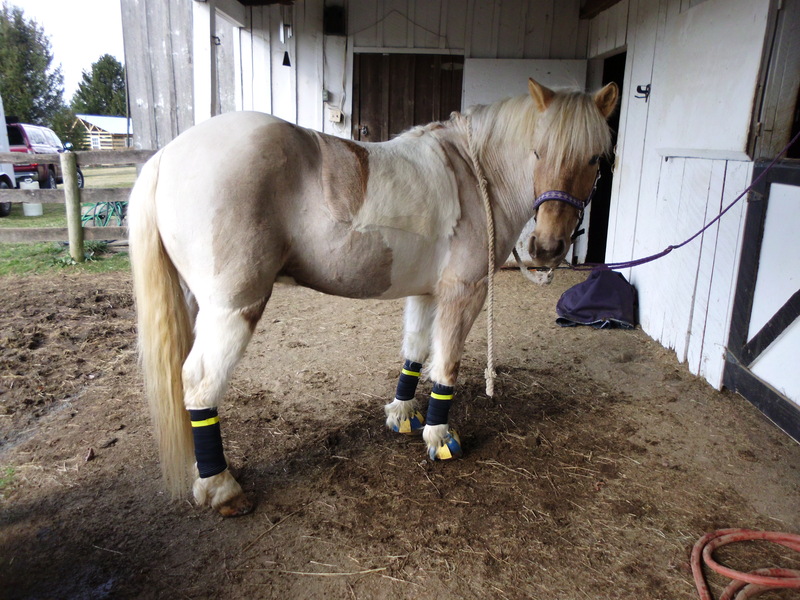 Simon was very pumped up and when it was our turn, instead of his usual plodding canter, he ripped up the field at a full gallop, performing like the games pony I have been hoping he could become. After that the races started to blur together. The crowd performed lots of collective “OOOOHS” and “AHHHHHHS” and a few “EEEEKKKK” type of reactions. The star of the show was 8 year old Sadie. 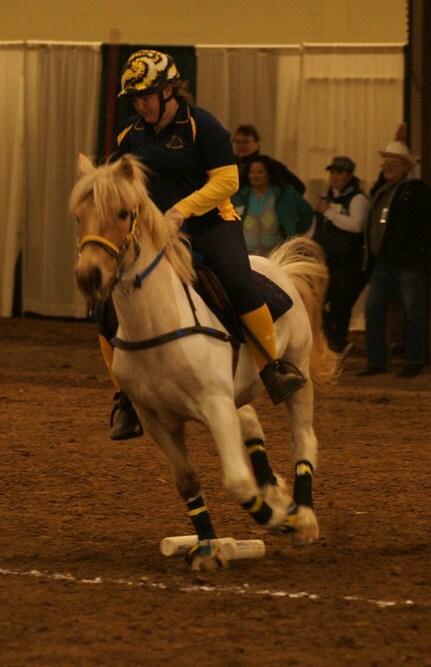 A tiny little thing, on a cute 11 and a half hand pony, Sadie has been playing games for a few years now, and is a determined and fearless rider. 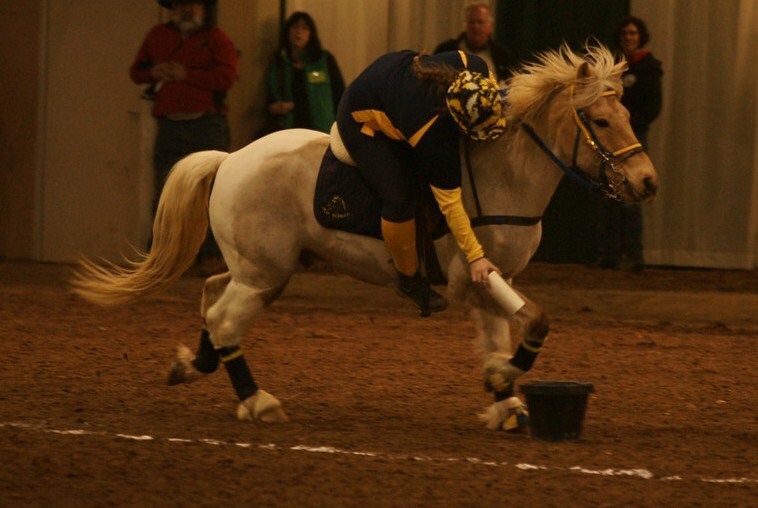 She did a fabulous running vault onto her pony and the crowd cheered uproariously loud. At the end everyone wanted to speak to “the little one”. 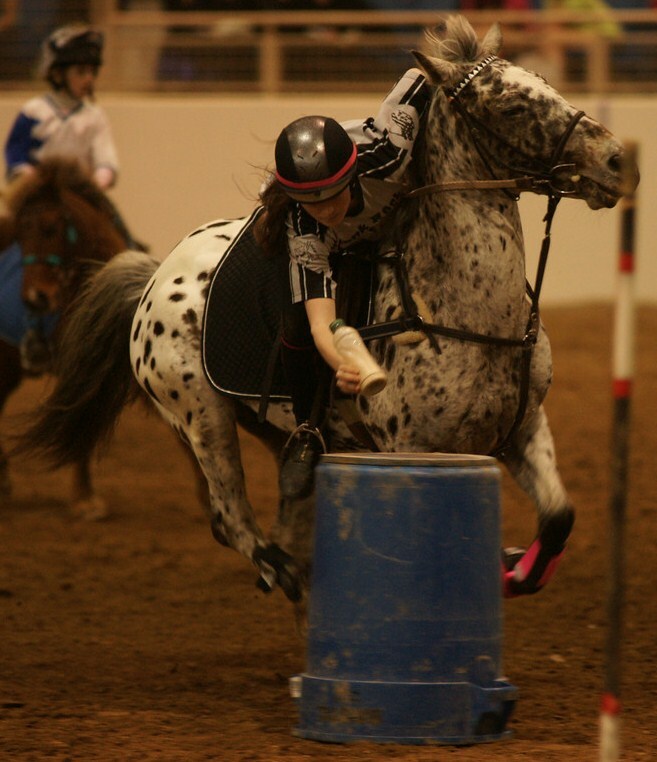 The other crowd favorite was Mackenzie on her leopard Appaloosa Inky. Mack and Inky are amazingly fast, and work together like a clock work team, with Mack vaulting on and off, and performing all of her skills at a full gallop. The striking appearance of Inky certainly caught spectators’ eyes and after the event I repeatedly heard interested individuals asking about the “Dalmatian pony”. Simon was so proud of himself and clearly liked performing for a crowd. He had his tail up through the whole event and although he was very nervous, he listened to me and worked to put on a good show. He is really becoming an outstanding games pony. I hope I can figure out how to get him to bring out that speed at our regular competitions. 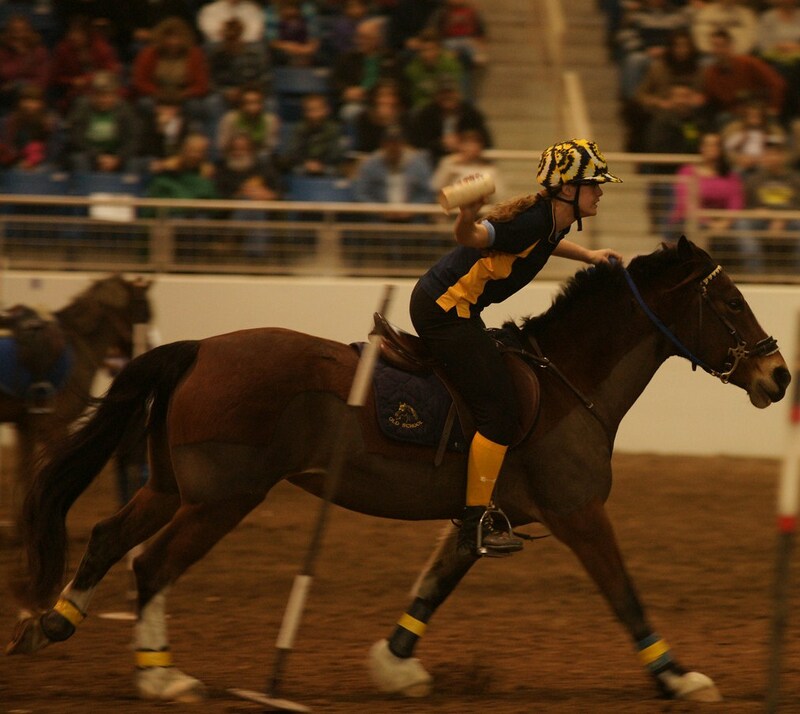 We completed 16 races before our hour was coming to an end and we used the last few minutes to ride around the edge of the arena and speak with the spectators still in the stands. I spoke to two parties personally and both told me it was the most exciting event they had seen at the expo. How awesome is that? 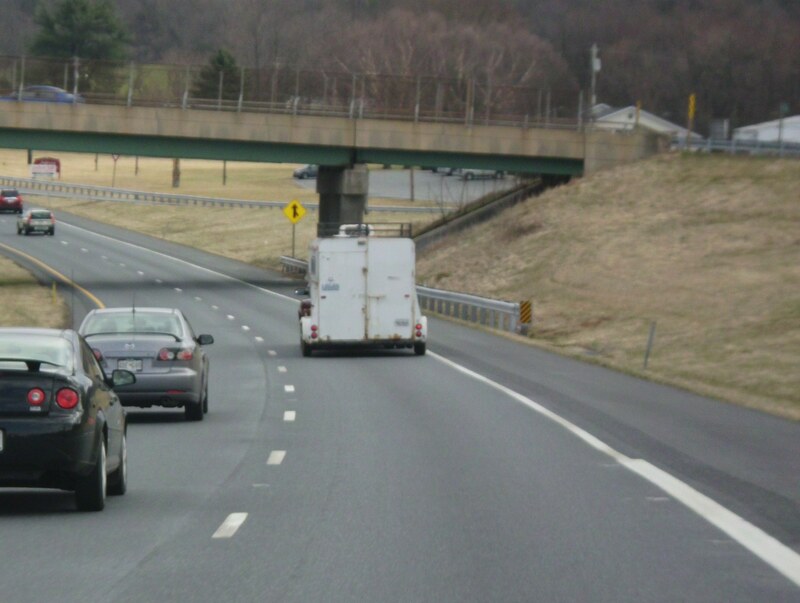 We left the arena full of adrenaline and returned to untack and blanket our hard working ponies and return them to their trailers with plenty of hay. Before taking off for home, we went inside to see how the stand was going, and as expected, it was booming with interested spectators. Half a dozen MGAA representatives were speaking with groups about games and brochures were being handed out. I stuck around for a while and helped out, before I decided I needed to go before I was too tired to make the drive home. On my way out I was stopped two times by spectators that had seen our demo and were on their way to our booth to get some more information. It was a really cool experience and I really hope it helps MGAA grow and gives more people the opportunity to try this fantastic sport.